This is the race where it seems Amy got her wish. One team gets so far ahead of everyone else, we got to watch them go through it all with no tension about them winning. At least some teams were bunched up together in the back to make it more exciting. Chad & Stephanie were the first team to leave at 11:10 am. Besides the clue, they were warned that somewhere on the leg, they would receive a double u-turn. Chad & Stephanie said if they had the chance, they would u-turn Nat & Kat. Stephanie said they were a threat and Chad didn’t want to lose to a pair of girls. Nice Chad. Clue: Teams had to fly to Dhaka, Bangladesh. When they landed, teams had to make their way to Sundarban Square Supermarket and find the sugar cane press. They had to use the press to fill a mug with sugar cane juice and one team member had to drink it to get their next clue. Jill & Thomas were the second team to leave at 11:27 am. Jill said they had to get to the u-turn first since other teams would want to u-turn them. I guess they don’t view anyone else as a threat. The tattoo couple were the third team to leave at 12:57 pm. The home shopping queens left the pit stop at 1:36 pm and the doctors were the last to leave at 3:37 pm. The first four teams bought tickets on the same flight that would be arriving in Bangladesh at 12pm the next day. Jill & Thomas were hoping that the ticketing agent could search some more and see if there was a flight that got in earlier than the tickets they already had. Chad was too concerned about eating a cheeseburger and Blizzard so Chad & Stephanie went off to find some food. The doctors purchased tickets to Dubai, but nothing after that. They were going to try to find something else that got them into Bangladesh sooner when they got to Dubai. Their flight to Dubai seemed to leave earlier than the other flight too so they were on a plane while other teams were waiting for their flight to leave. Standing around with the ticketing agent seemed to work since Jill & Thomas found a flight that got them into Bangladesh at 5 am instead of noon. The home shopping queens picked up on something happening while they were standing not too far from Jill & Thomas. While the home shopping queens went to see if there were any seats on the same flight, Jill & Thomas were boarding their plane. Thomas was joking there was no time to eat, they had to get on the plane. The flight was full so the home shopping queens were sad about being seven hours behind. They commiserated with the tattoo couple about being last, but Nick pointed out that he didn’t think Chad & Stephanie got the same flight. Nope, they didn’t! Chad & Stephanie were oblivious eating in a food court when all this was happening. The tattoo couple and the home shopping queens started working with different travel agents to find earlier flights. The tattoo couple found one that arrived at 8:40 am. The home shopping queen’s agent found the same flight, but the tattoo couple’s agent was quicker. They got the last two seats on the plane. The home shopping queens thought they were the last team leaving so they were thrilled when they found Chad & Stephanie, but then Chad & Stephanie learned that eating might have made them lose the race. They did wonder where the doctors were. They were in Dubai, trying to find a flight to Bangladesh. They ended up on the same flight as the home shopping queens and Chad & Stephanie. While headed to the supermarket, Jill commented that someone was walking with a wheelbarrow in the middle of the street. Thomas informed her it was a rickshaw. Oh dear. They arrived at the sugar cane press, watched how the guy did it and then filled up a mug. Thomas decided to be the one to drink it. After he was done, Jill wanted to taste it so she had a little sip from some extra juice they had. Thomas opened up the next clue, which was a detour. Detour: In Balanced Meal, teams had to pick up a metal bowl that is attached to three other metal bowls in a stack of interlocking containers. 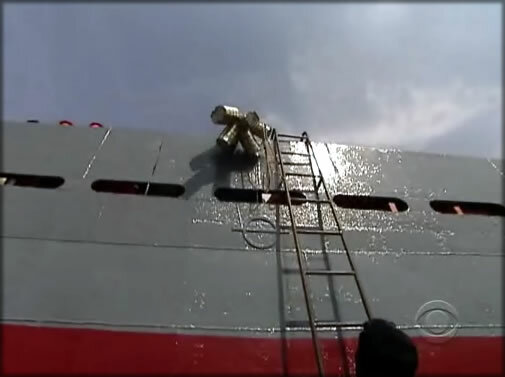 They had to travel across the harbor to a cargo ship and hoist 30 containers to the deck. Once they finished, they had to go back to deliver 10 empty containers to pick up their next clue. 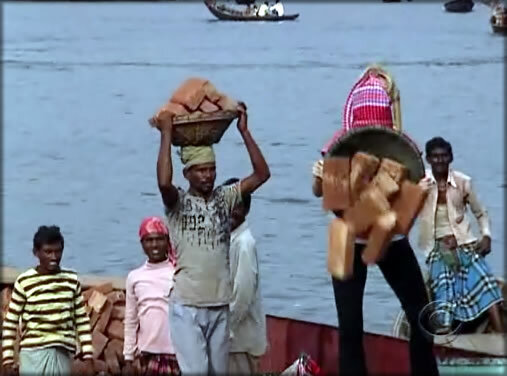 In Balanced Bricks, teams had to use their head to deliver bricks from a supply barge to a nearby shop. They would get their next clue when they delivered 100 unbroken bricks. Thomas wanted to do the brick task. They got in a rickshaw to get to the task, which freaked Jill out due to the congestion of traffic and people all driving or moving randomly around. Thomas told her to keep her extremities inside the rickshaw. Jill asked if he meant her yelling and he explained extremities were her arms and legs. Has she been hiding this special dumb side to her until now? When they arrived at the barge, Jill put the bowl on her head with the bricks. Then she promptly lost her balance and dropped all the bricks. She got another basket and started walking. Thomas encouraged her to just take her time and walk slowly. He was commenting on how heavy the bricks were and amazed at guys half his size were doing it with twice as many bricks without breaking a sweat. They had to weave in and out of traffic (cars and people) to get to the counting station to dump their bricks. When they were done with their first load, they headed back for some more. Meanwhile, in Dubai the doctors found out they were on the same flight as the home shopping queens and Chad & Stephanie. Back in India, Jill & Thomas finish the task while dripping in sweat. They got their next clue. Clue: Teams had to make their way to Dhaka River Port on foot. When they arrived at the river port, they saw the U-Turn. Normally, only one team can use it on another team. It is after a detour where one team can decide another team behind them has to do the other part of the detour they just finished. For the first time, two different teams can u-turn two teams to perform the other detour task. Jill & Thomas decided to use it on the home shopping queens. They saw them as a top contender so they wanted to knock them down a bit and possibly knock them out of the race. They also picked up their next clue. Clue: Teams had to take a bicycle rickshaw to Nazira Bazaar. Jill & Thomas found a road block with the next clue. Road block: Teams had to properly assemble a bicycle rickshaw using the parts provided. Jill decided to do it. She look at the all the parts and said there were a lot of “nuts and bullets”. It is like listening to Gloria from Modern Family say the wrong words, but English is her second language. What is Jill’s excuse? She had to make sure she correctly assembled the wheels, seat, canopy, bell, tassels, pedals, back seat and chain. She had finished the wheels and seat when the second flight with the tattoo couple landed in Bangladesh. When she finished up the canopy, she finally called them “nuts and bolts” and said “I think that’s what they are called.” Thomas was cheering her on along with about a million other people watching her. The tattoo couple found the sugar press. Vicki told Nick that he looked like a pro working it and the drink looked good. He asked if she wanted to drink it and she said no. Jill finished up the bell of the rickshaw when Nick finished his sugar drink. He said it didn’t taste very good, but he downed it pretty quickly. They got the detour clue and picked the Balanced Meal task. Jill finished up the tassels, pedals and back seat when she asked the guy to check it. He said it wasn’t done. She had missed the chain, but he didn’t tell her what she had missed. The tattoo couple got to meal place and picked up 30 containers. Nick spilled some of one on him while they were loading up the boat to take them to the cargo ship. The last three teams finally arrived in India. Jill didn’t know what she was missing, but she finally figured out it was the chain. It was on the rickshaw, but not really connected so it wasn’t obvious that it wasn’t really ready. She got it lined up where it should be and had her rickshaw checked again. The rickshaw guy approved and they got their next clue. 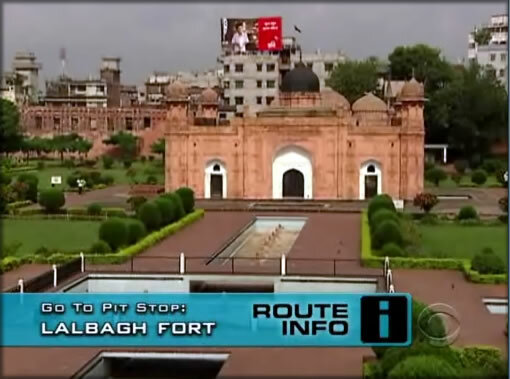 Clue: Teams had to make their way to the next pit stop, Lalbagh Fort. Jill & Thomas had to get really lost to not get to the pit stop first. Back at the detour, the tattoo couple made it to the cargo ship. Nick climbed aboard and tossed a rope down to Vicki. She tied 10 containers to it and he dragged it up to the ship. Then they repeated it two more times. The last three teams were at the sugar press. Of course, Chad found a way to yell at Stephanie about doing it wrong. He said she wasn’t bending the sugar cane enough to get all the juice out. I thought that’s why there was a press…to squeeze the sugar juice out. They all finished around the same time. Chad, Kat and Brook chugged the sugar water. They all finished and got the detour clue. They all decided to do the balanced meal one. Not all the teams went in the same direction to get to the port though. Jill & Thomas arrived at the pit stop in first place. As the winners, they won a $15,000 Discover gift card. The tattoo couple had finished delivering the food and Nick had 10 empty containers to deliver back to Vicki so they could go turn them in for their next clue. They got it and moved onto the double U-Turn. They were shocked to see that the home shopping queens were on the board since the other teams were so far behind. They were going to pick Chad & Stephanie and then Vicki didn’t want to U-Turn anyone. She said she knew that they were behind them for sure. Um, yes, you only U-Turn people behind you to get them out of the race altogether. WAT! Uggg…. so they just moved on, leaving another team to U-Turn someone else. It turns out that Chad & Stephanie’s rickshaw driver took them to the wrong place. The home shopping queens and doctors were dropped off closer to the water and the food. The doctors were the first ones to find the food guy and filled up their boat. The home shopping queens were trying to find the food guy and Chad & Stephanie were trying to find out how to get close to water. The home shopping queens finally found the food guy and Chad & Stephanie finally found a rickshaw driver that knew where to go. The tattoo couple arrived at the road block. Nick decided to do it since he was used to putting bikes together. He finished up the wheels by the time the doctors made it out to the cargo ship. The doctors had some extra straps with them so they hooked up all the cans together and brought up about 10 at a time too. The home shopping queens arrived at their cargo ship but they were pulling up about five containers at a time. Chad & Stephanie finally made it to the river and filled up their boat. Nick completed his rickshaw, but didn’t have the chain hooked up. He was confused by what he was missing. The doctors and home shopping queens finished around the same time, with the doctors just ahead of them. Chad & Stephanie were just getting to their cargo ship when the other teams were almost back to land. The home shopping queens saw them and were excited that they could possibly U-Turn them. Back at the roadblock, Nick was confused by what he was missing. Vicki told him to remain calm and it would all make sense. He finally realized it was the chain. They got the pit stop clue. The doctors made it to the double U-Turn next. First, they were thrilled they were not on there. Then they saw the only other option was Chad & Stephanie so they put them on there to help them survive. They got the next clue and headed towards the road block. Chad is going to be mad and I bet it will somehow be Stephanie’s fault! The home shopping queens got to the U-Turn and saw they had to go back and do the other task. They couldn’t believe it at first, then then Brook just got over it and said they still were ahead of Chad & Stephanie at that point so they had to go do the brick task as quickly as they could. Chad & Stephanie were loading up their last containers of food while the home shopping queens started on the brick task. Claire started to complain but Brook told her she had to stop. She was positive no matter what. The tattoo couple came in second place with Phil. Vicki told Nick that being nice did pay off and he agreed. Chad & Stephanie finished up their meal detour and headed to the double U-Turn. They were asking for directions but all the locals wanted to take them on the rickshaw instead of telling them. They knew they had to walk there. The home shopping queens dropped off their first set of bricks. Brook told Claire they had to run back. Claire said she had to take it slow so she could actually finish it. Brook said, “Okay, you take less and I’ll take more.” Brook is a trooper! Chad & Stephanie couldn’t find where the U-Turn was located, even though every other team seemed to find it quickly. The doctors were at the road block and Nat did it. She said she did has some experience putting things together from IKEA. Going back to the bricks, Brook had twice as many as Claire and was still telling Claire to hurry. They had about 60 bricks and were talking about their legs tingling. They were also wondering why they hadn’t seen Chad & Stephanie. Chad & Stephanie finally got directions from someone where the U-Turn was located. Nat was struggling with keeping the bell on the rickshaw. Chad & Stephanie finally found the U-Turn and saw they were on it. Surprisingly, they didn’t explode. They were thrilled to see the home shopping queens on there too. They ran off to find the brick detour. Before Chad & Stephanie even started though, the home shopping queens finished the second detour. While the home shopping queens were running off to the road block, they seemed to no longer be friendly. Claire was begging Brook to slow down while Brook wasn’t having it. Meanwhile, Chad was encouraging Stephanie until she said she felt her bricks about to fall off her head. Then the yelling started. She finally yelled back. Then it was fun yelling time while they stacked bricks! When they were getting close to done, Stephanie felt like she was going to throw up with the physical exertion and extreme heat. Chad told her not to grab so many bricks. Meanwhile, the home shopping queens arrived at the road block and found the doctors. They were both impressed with themselves about how they did both detours and still ran into the doctors at the road block. Brook decided to do it. She said she was going to “charge through it like a spider monkey.” Chad & Stephanie finally finished the other detour and got their clue that would lead them to the road block. Brook and Stephanie were close to being done. Stephanie had never put a bike together before, but was pretty quick about it. Nat finally figured out all the pieces that needed to go on to secure the wheels so she finally finished. The doctors got their pit stop clue and were off. They did tell the other teams good luck. Stephanie was having a problem with the back seat and Brook was having a problem with the bell. Brook finally figured out how to get the bell to stay on and Stephanie finally figured out how to get the back seat on. Brook got her clue just before Chad & Stephanie got their clue. They were both racing to the finish line. The doctors got to the pit stop and checked in with Phil for third place. The other teams couldn’t find any taxis so they were both running towards the pit stop. They both found some locals that showed them where it was located. The home shopping queens got to Phil first so they were checked in for fourth place. That left Chad & Stephanie to be the last team to arrive and they were eliminated from the race. What did you think about the Double U-Turn? Was it better than a single one? Or did it matter? What do you think about Chad & Stephanie going home? Are you glad it was them or do you wish it had been either the doctors or home shopping queens? Do you think that the decision to eat instead of trying to find earlier tickets cost Chad & Stephanie the game? They did think everyone was on the same flight at the time, but they did know that Jill & Thomas were going to keep checking for earlier when Chad decided he really wanted to eat. My dream! It was interesting because they were so far ahead but also they didn’t seem to have much trouble with the tasks – Note to future Amazing Race Teams – really makes sense to double check those available flights! I was having a spaz attack with the lack of personal bubble space in this city! I do not think I will be visiting! Brook is amazing with her positive attitude and I was sad when she and Claire were fighting but I’m glad they are still in it! 1. The Double U Turn was interesting – it is interesting to hear what the teams think about other teams and the strategies I’m not sure that having 2 made a huge difference since when the 2nd one got used, there was no other option. I’m also glad it was Chad & Stephanie going home. I would have been sad if it was the home shopping queens or the doctors, especially after Chad continued to be an asshat. I did like that there were two double u-turns. I mostly liked it because it made Chad & Stephanie do the task too or else it might have been the home shopping queens going home.